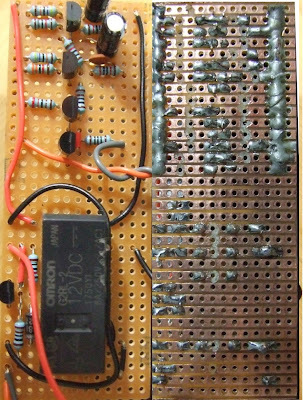 This experiment calls for a protoboard in the same layout of a breadboard, which does seem a great way to introduce beginners to transferring projects from solderless breadboard to permanent perfboard. However I found this nigh on impossible to find in the UK. I settled using a perfboard and arranging the layout in a somewhat similar manner to a breadboard. At the top of the board is the alarm circuit created back in experiment 11. At the bottom is a circuit that when triggered by an opening in the sensor circuit (i.e. opening a door) turns power on to the alarm circuit. If the sensor circuit is then closed again (door closed) power is still supplied to the alarm so it does not turn off. This is explained exceptionally well in the book however I think I only truly appreciated how the circuit worked when making my own (far less elegant) arrangement on a breadboard to see how it all worked from the schematic diagram. I soldered everything on the stripboard first, then I took a dremel to it with a cutting wheel and trimmed it down and then sanded the sides, it fits in just between the slots in the project box so I don't have to screw it down (very convenient! ).